– the blades will not fly together. This phenomena is often typified by charts as similar to those below. The first question which should have been answered many years ago is: WHY won’t these blades fly together? WHY? : These blades will not fly together primarily because of a mismatched Span Moment Arm. 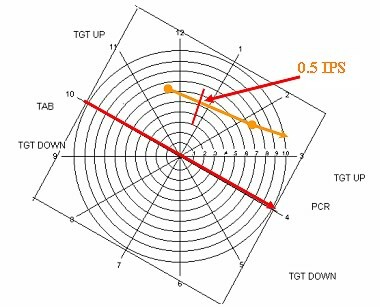 A new approach to Blade Management needs be adopted based on the control and correction of Span Moment Arm migration of operational blades at operator level if improvements to RTB efficiency are to be obtained. The traditional approach never looks at the entire balance solution. It only ever uses the Dynamic RTB to balance a rotor. The solution must incorporate BOTH Static & Dynamic balance to achieve an efficient result. Traditionally blades were attempted to be matched by a number of administrative methodologies such as matching hours flown on each blade, matching serial numbers or a combination of both. Whatever method, more often than not, it boiled down to a time consuming trial and error process to find a matched set of blades tat would fly together. On multi-bladed systems, static balance is only ever done when new or when the blade is sent for a major overhaul at an approved blade repair center which has a master blade. On teetering heads such as the UH1, operators perform simple “see-saw” or pivot balance. The limitations of this procedure are listed elsewhere on this site. The result of this method however is that it only promotes the use of “sets” of blades – it does not provide a means of making all blades interchangeable. This method of static balancing also is limited by using the Dynamic adjustment weights/stations to correct for a static problem – thus reducing the amount of dynamic adjustment available to solve dynamic problems. The traditional blade management process allows the Span Moment Arm of individual blades to migrate – UNDETECTED. This results in mismatched blades. Lets follow the path of this migration and how it reduces the dynamic weight adjustment progressively to the point where blades become unflyable with other blades. See-Saw Balance of Hub PLUS blades. Static Span Correction using DYNAMIC Adjustment. Results in LESS Dynamic Lateral adjustment for RTB . Blades may or may not fly together. If Blades fly successfully together, in-service migration of Span Moment Arm will occur. Successive RTB exercises tries to compensate through life of blades using ONLY Dynamic Adjustments. Ultimately will not fly together as Span Moment migrates to a point which is greater in magnitude than the Dynamic Adjustment by itself is capable of compensating for. Initial RTB when new blade fitted to an existing head (providing the Span Moment Arm of the other blades on the head have a similar Span Moment – or else the “New” blade will show up immediately as a “Rogue” blade). Ultimately will not fly together as Span Moment migrates to a point which is greater in magnitude than the Dynamic Adjustment by itself is capable of compensating for – now a decision must be made to accept the existing vibration level or change a blade – BUT which one? Do any of the above scenarios sound familiar to your own experiences? If so, you may want to consider adopting a New Blade Management system and routine Static Balancing on the hangar floor. Why Does Span Moment Arm Migrate? How can we adjust Span Moment arm? Provides Mass only of the blade – Current weighing procedures do not provide the customer with value of individual Span or Chord Moment arms or CofG – check out your blade paperwork next time you get a new or overhauled blade – check your current blade paperwork. Deviation from Design Specifications or the “Golden” Master Blade a likelihood. With the identification of the cause of Rogue Blades, it is now clear that a new approach to blade balancing or more precisely – Blade Management needs to be adopted. The traditional inefficiencies and cost can no longer be afforded by an industry where capital costs and Direct Operating Costs are very high with a disproportionate pressure to keep charge-out rates very low forcing very thin profit margins. Defence and Government air wings are not immune from the drive for “more bang for the buck”. Shrinking budgets worldwide coupled with the accompanying political pressure necessitates that these organizations think more commercially and seek more flying hours per maintenance dollar. We have always treated Static & Dynamic balancing as two totally different, unrelated exercises – they should not be. 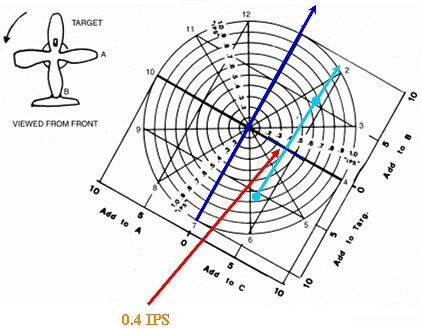 A successful Dynamic balance is very dependant upon a good Static balance – most importantly – the Span Moment being maintained within a reasonable tolerance of the ideal “Spec” figure if blade interchangeability is to be assured and if the full benefit of the dynamic adjustments are to be provided to counter any dynamic problems. This New Management procedure does not advocate that a static balance needs to be done every time an RTB is done. It is based on a periodic static balance to particularly check Span Moment Arm, whenever scheduled routine maintenance is carried out in the existing servicing schedule – no additional maintenance is called for. It is recommended at routine maintenance on or about every 500-600flt hrs (or after blade repair/painting). This will ensure Span Moment Arm Control within tight limits and enable trouble free RTB and remove “rogue Blades” from your fleet and inventory blade stock ensuring total blade interchangeability across your fleet. For a comprehensive Blade Management plan see the download page. The US Army is projecting a savings of more than U$1.0M per year at Corpus Christi Army Depot alone by using this technology. See Redstone US Army Cost Savings Free Download for details. A cost benefits analysis spreadsheet is available free, to assist in quantifying potential savings. 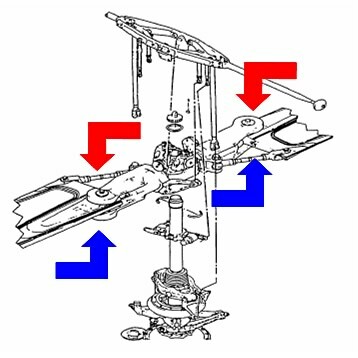 See the Rotor Blade Management Free download. Converting from a Traditional Blade Management plan to a New Blade Management Plan is simple, easy and straight forward. Cost is minimal in capital outlay – this cost easily recovered with the reclaiming of even one rotor blade. There is effectively no man hour cost since in the mature Blade Management Plan, static balancing is done during scheduled maintenance when blades are already off the aircraft. The Static Balance itself takes no more than 10 minutes per blade. Strategic positioning of tools ensures that blades can easily be passed over a static balance on a routine basis. After the initial introduction and resetting of a fleet of blades back to OEM specifications, this be maintained by periodic checking. Significant simplification of blade paperwork and administration is achieved. Individual tracking of blades to achieve a “flyable” set is eliminated. Any blade out of the box should fly with existing in-service blades. Paperwork is summarized by computer generated printouts detailing the date, initial blade results, subsequent adjustments performed and the final blade mass, Span & Chord Moment arms and CofG. Potentially large numbers of administrative man hour savings are achievable. Develop an efficient, easy Static Balance capability for the operator – a virtual Master Blade. RTB made more efficient, Reduced Maintenance costs. Removes “guess work” from RTB and the time consuming trial & error approach to matching blades which as been traditionally adopted. For more advantages, see Free Rotor Blade Management download.